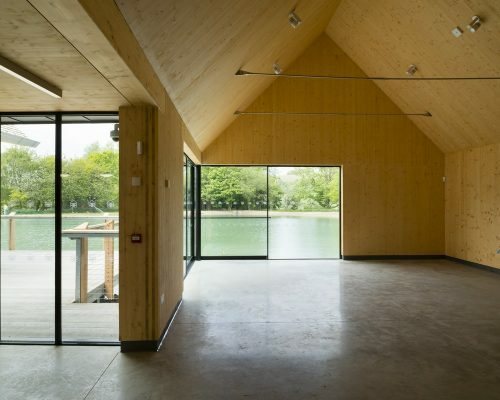 Edward Cullinan Architects collaborated with the engineers Buro Happold and Green Oak Carpentry Company to develop this innovative, award- winning low energy structure. The building consists of two elements: the Archive on the lower level serves as the Museum’s storage, administration centre and exhibition hall and the Workshop above is where carpenters restore and build the timber frames that will go into the Museum’s many collected buildings. The Archive uses heavy construction and is partly buried in the ground, in so achieving the required steady climatic conditions for the stored artefacts. In contrast the workshop above is enclosed in a lightweight timber gridshell. The project has been built into a treasured landscape within an Area of Outstanding Natural Beauty.